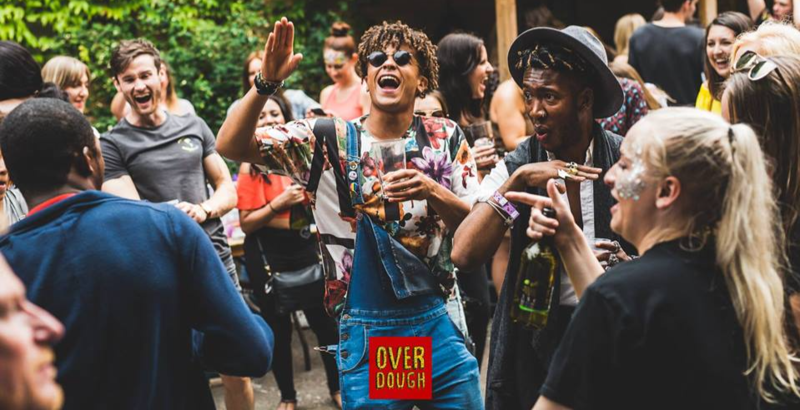 Over dough is a pizza party like no other designed to surprise and excite. After the success of last year’s events we’re back with a bang at brand new venue DUO! You won’t find anything else like this, from a Bottomless cocktail hour to hip-hop karaoke the party never stops. Dress code… express yourself! Whether your style is a pikachu onesie or a snoop lion rasta cap we’re up for anything! All you need to bring is an empty stomach and an appetite to party! The order is up! The Pizza is sliced! The Party is here! 14:30 – 17:00 – Hip-Hop Karaoke, dj and games!! TERMS & CONDITIONS FOR TICKET PURCHASES: 1. 1 hour of a bottomless cocktail will be served from 12-1pm and is included in the ticket price. This offer is valid only from 12-1pm. There are no refunds for ticket holders if they miss this. 2. Unlimited pizza will be served from 1-2pm and is included in the ticket price. This offer is valid only from 1-2pm. There are no refunds for ticket holders if they miss this. 3. This ticket entitles the ticket holder to a single entrance. 4. It is advised to arrive early to avoid queuing times. 5. Entertainment, menu, venue and the timings may be subject to change. 6. Dress code is casual. 7. On arrival to the venue, please bring your e-mail confirmation, the card used to purchase the tickets and ID (passport, driving license or any GOV-approved ID) as this is an 18+ only event. Once you reach the front of the queue, your information will be checked off by the door host for entrance. 8. The ticket holder must adhere to the venue’s entrance guidelines (age restriction, dress code, intoxication, etc.). Failure to adhere to these guidelines may result in refusal of admission, this is at the door staff & security team’s discretion. 9. Refunds will not be issued if the ticket holder is refused admission for failure to adhere to the venues entrance guidelines. Refunds will only be issued should the event be canceled. 10. The ticket holder is responsible for informing us of any specific dietary requirements or allergies. We therefore accept no responsibility for any and all allergic reactions howsoever caused. TERMS & CONDITIONS FOR TICKET PURCHASES: If you have any dietary requirements, please ensure you have notified us in the relevant section at checkout. 1. 1 hour of a bottomless cocktail will be served from 12-1pm and is included in the ticket price. This offer is valid only from 12-1pm & times may be subject to change on the day. There are no refunds for ticket holders if they miss this. 2. Unlimited pizza will be served for 1 hour and is included in the ticket price. This offer is valid only for 1 hour. There are no refunds for ticket holders if they miss this. 3. This ticket entitles the ticket holder to a single entrance. 4. It is advised to arrive early to avoid queuing times. 5. Entertainment, menu, venue and the timings may be subject to change. 6. Dress code is casual. 7. On arrival to the venue, please bring your e-mail confirmation, the card used to purchase the tickets and ID (passport, driving license or any GOV-approved ID) as this is an 18+ only event. Once you reach the front of the queue, your information will be checked off by the door host for entrance. 8. The ticket holder must adhere to the venue’s entrance guidelines (age restriction, dress code, intoxication, etc.). Failure to adhere to these guidelines may result in refusal of admission, this is at the door staff & security team’s discretion. 9. Refunds will not be issued if the ticket holder is refused admission for failure to adhere to the venues entrance guidelines. Refunds will only be issued should the event be canceled. 10. The ticket holder is responsible for informing us of any specific dietary requirements or allergies. We therefore accept no responsibility for any and all allergic reactions howsoever caused.